My time at Sweetgrass was coming to an end. Glenn and I started a special order, tent poles. 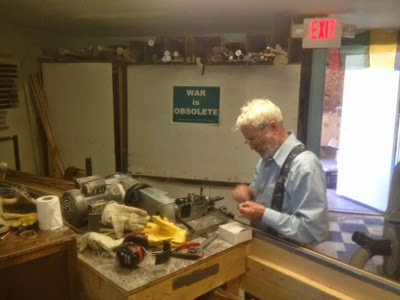 As he dialed in the milling machine, I though that this was sort of like Michelangelo painting some cheap advertisements in between some of his more famous works. But hey, the bills have to get paid too. Glenn and I split, hollowed, glued and wrapped the poles amidst the usual distractions, Glenn told me the story of two mounts on the wall. 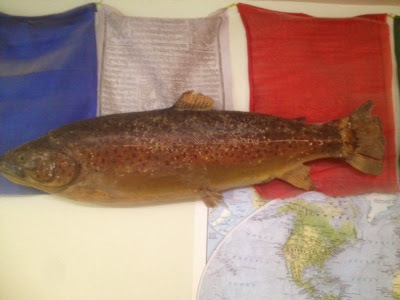 One tattered old brown, a 33 inch fish he caught in Hat Creek the day before he joined the army. 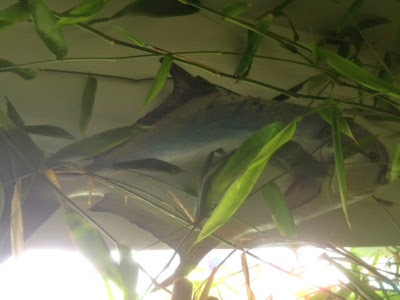 The other, hidded behind an overgrown bamboo plant, was the seventh permit ever caught on a bamboo rod. After we were done, he took me too meet Wayne Maca, a one-time Sweetgrass employee who used to make snowboards for olympians, and now experiments with revolutionary bamboo rods that are entirely hollow, and have graphite ferrules. I cast a 5 weight on the Beaverhead behind his shop and thought it was great. After I was done, Glenn cast a few beautiful loops into the ever-present Montana wind, and while he did so, I asked Wayne about the cryptic markings on both sections of the rod. He explained that he encodes his serial numbers, to throw off collectors and prevent any sort of elitism based on the date that the rod was made. After a good chat, Glenn drove us back to Sweetgrass and said goodbye. I hung around a bit longer, then said my goodbyes, bought a souvenir or two, and headed over to meet one of the Sweetgrass guys for one last evening on the Ruby before heading to Yellowstone and guide school. It was slow, and no one got a fish, but I did manage to trick one fish into taking a PMD, but he popped off. Them's the breaks! All in all, a great week with a great bunch of artists, keeping an important craft alive and relevant in an age of high modulus graphite. Montana, day 7. Sweetgrass, and skunked.